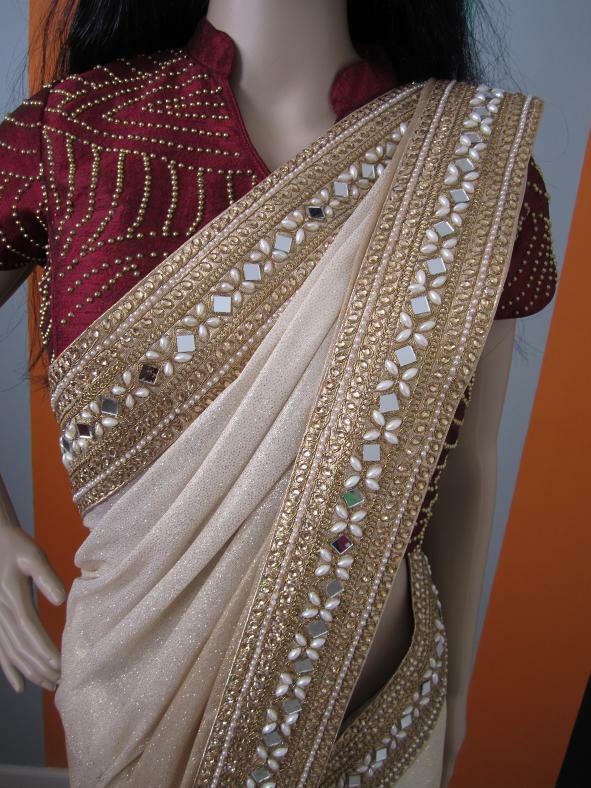 Wedding / Party Wear Designer Gold Shaded Shimmer Saree with Designer Rich Maroon Silk Blouse with Bead Work allover. Drape this classy partywear shimmer gold shaded saree and look outstanding like never before. This awesome beautiful saree features a classy mirror & bead work border matched with rich maroon silk blouse with bead work allover, which makes it a smart pick for upcoming party / wedding. This saree measures 5.5m. This saree is light in weight and easy to carry all day long. Best thing about this saree is you can match any blouse to give different look for your various events. Blouse Size - 32 can be customized up to 38. Buy Wedding/Party Wear Designer Gold Shaded Shimmer Saree w/ Designer Blouse, sold & shipped by Elegant Attire where you can shop online for Bespoke Designer Indian Fashion Clothing for Girls and Women. This Wedding Saree collection has been tagged as Wedding Sari, Party Wear Dress, Designer Gold Shaded Saree.